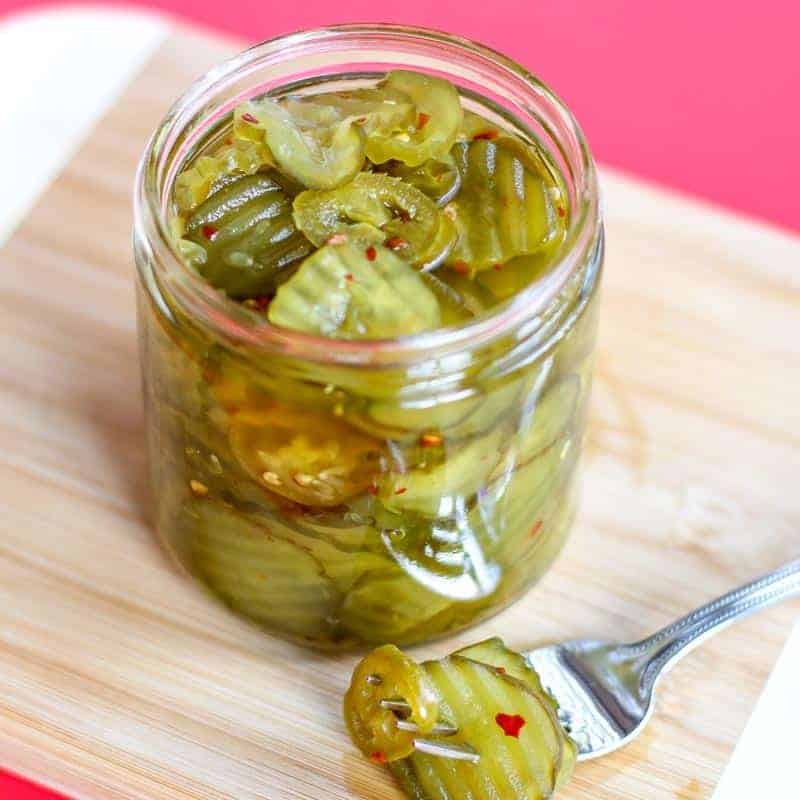 This is an easy Fire and Ice Pickles recipe. 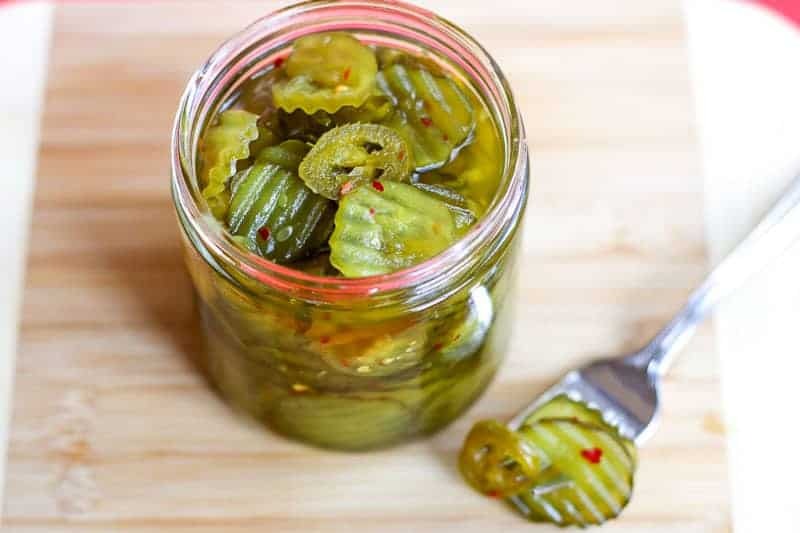 Fire and Ice Pickles are spicy, sweet, sour, flavored with dill and garlic. 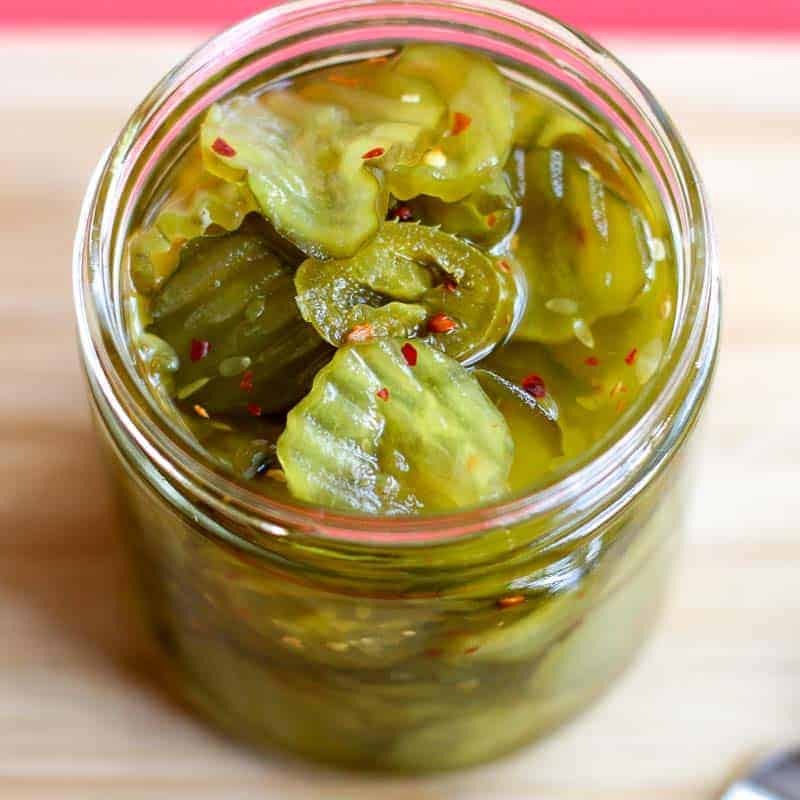 Fire and Ice Pickles are DELICIOUS and easy to make. They are sweet, spicy, and sour. 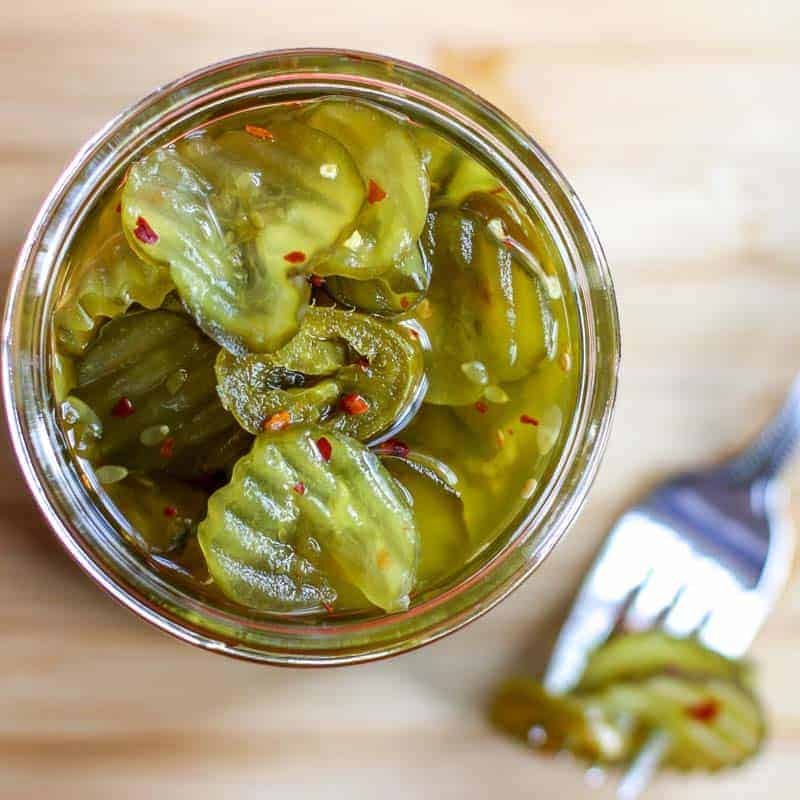 This recipe is a little more sour and a little more spicy than the typical Fire and Ice Pickles recipe. I like my pickles with lots of heat and lots of pucker! So pucker up buttercup! As I write this post, I am actually snacking on a small bowl of these pickles. I can’t help myself. They are so addicting! Looking at the pictures made me run to the refrigerator and grab a bowl. They are hot, sweet, sour, garlicky, salty, and crunchy… and MAN ARE THEY GOOD! Now these are NOT your typical sweet pickle. My Grandmother would not touch these pickles. She liked her sweet pickles simply sweet. 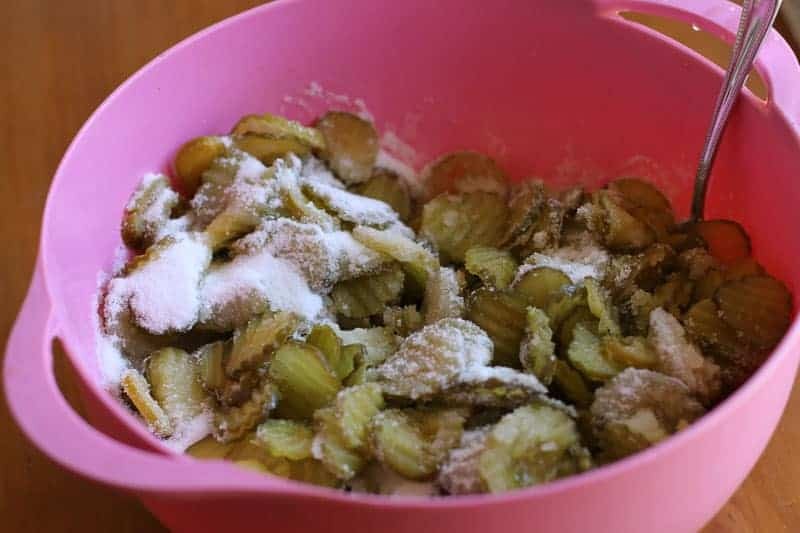 She would snub her nose at the dill, garlic, and hot spices that you taste in every bite of these pickles. I am not a big fan of the traditional sweet pickle. I would rather choose a dill pickle any day. When you mix these tart, sour, dill pickles with some garlic and sugar; then take a bite…. WOW! Your taste buds do a dance in your mouth like no other. They just get crazy moving all around until you find yourself almost half a jar gone in a blink of an eye. Don’t say I didn’t warn you! This is a semi-homemade recipe. You mix dill pickles, sugar, garlic, red pepper chili flakes, and jalapeños in a bowl. Allow them to sit for a while, then throw them back in a jar. That’s it! Next thing you know you have one of the best-tasting pickles ever. 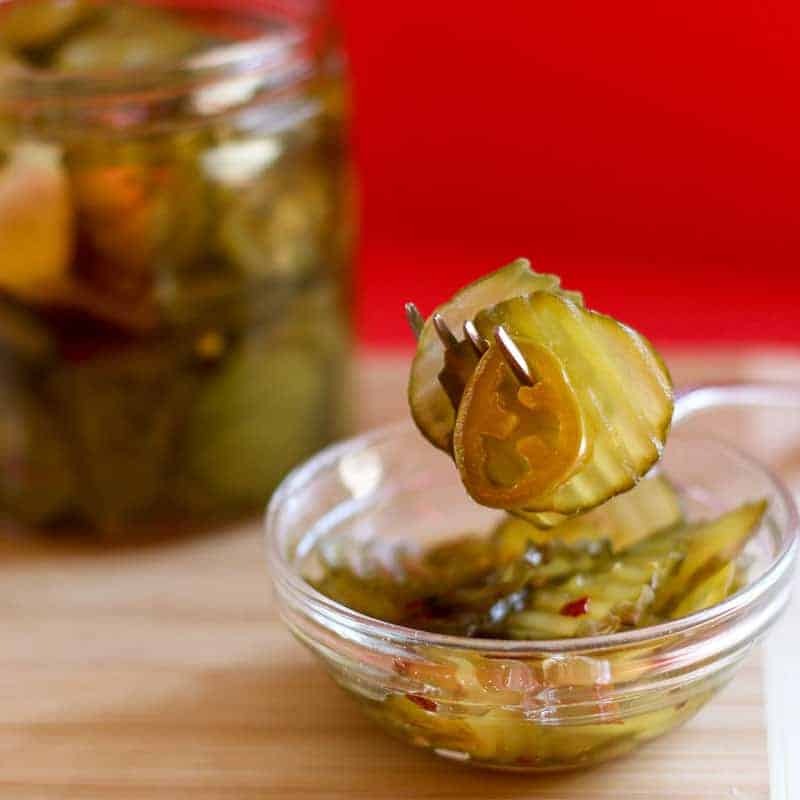 These pickles are great for tailgating, barbecues, on a hot dog, for a snack. They also make wonderful housewarming gifts. In the South, it is a tradition for many to make these at Christmas time. They are so good, I make them all year. Now I am going to tell you something very important that is key to making these. DO NOT USE KOSHER PICKLES!!!!! I don’t know why, but if you use Kosher pickles, they will end up rubbery. Then you will blame me for a bad pickle. So I am forewarning you now. 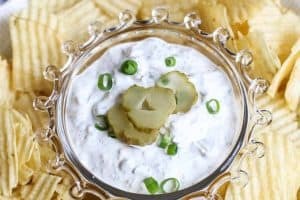 I used hamburger dill chip because they are easiest to find and they are already sliced. You can use whole pickles and slice them thicker if you like. You would make the recipe the same way and they are just as delicious. However, the whole dill pickles are not sold everywhere anymore. Stores sell mostly Kosher whole pickles. That is why I did not use the whole dill pickles in this recipe. Food Lion is the only local place I have found the Whole Dill Pickles. 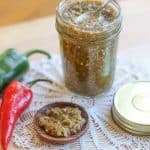 If you like this recipe, check out: Fresh Hot Jalapeño and Garlic Relish, Dill Pickle Dip, and Jalapeño Cilantro Hummus. *This post contains affiliate or referral links. If you want to make the pickles as gifts, the Ball jars are a great size for re-jarring the pickles in. This is an easy, hot Fire and Ice Pickles recipe. Fire and Ice Pickles are spicy, sweet, sour, flavored with dill and garlic. Drain pickle juice reserving 1/4 cup of juice. Sugar will extract the juice from pickles. Add back in the 1/4 cup pickle juice to keep the sour dill pickle taste. Cover and store in refrigerator for 4 or more hours. Transfer pickles and juice back into original jar or smaller jars. Store in refrigerator. *Shelf life should be as long as original pickle shelf life as long as stored in refrigerator. **If you do not want them hot, omit jalapeños and red pepper flakes. You will take 4 tsps of pickled slices out of a jar. They will be jarred jalapenoes, not fresh. What is considered 4 tsp of jalapeno? Four of them? Don’t throw that extra pickle juice away!!! Save it. When I get leg cramps a big shot of dill pickle juice eases them immediately. It’s amazing how fast it works. I have friends now who are true believers as it has worked for them as well. The only problem ya that I am throwing away pickles because they end up in the jar with no juice. This is a great way to have to keep that awesome pickleness from going to waste. You save 1/4 cup of the original pickle juice and get rid of the rest. You add that 1/4 cup of pickle juice back in to mix with the sugar and pickles. All of this will go back into the jar. Hope I made this a little clearer. Good luck! They are my favorites! When you pour the juice back into the jar. Is it the 1/4 cup of juice thats been soaking with the pickles or the juice you originally drained from the pickles too? Made up a batch tonight!!! So excited to see how they turn out! They can be ate as soon as four hours after making them, however, for optimal flavoring, they taste best after 3 or more days of sitting in the jars in the refrigerator. I was going to make these but was wondering g….how long do you have to let them “sit” before eating them? I honestly don’t know how it would turn out because the pickles have already been pickled once… Sorry. I just don’t know. If You wanted to can this could you…..water boil sealing then to keep longer? I said to omit jalapeños and red pepper flakes if you don’t want them hot… they would be sweet and sour only if you omitted them. In the recipe ingredients, it lists 4 tsp red pepper flakes and 4 tsp pickled jalapeño. I hope this helps. In your notes you said red pepper but in recipe you don’t have it listed. Did I miss somthing thanks making them now. They are pickled. You are going to love this recipe if you like hot, spicy, and sweet with a little pucker. Enjoy! The original recipe says Jalapeno but the printable recipe says Jalapeno pickled. Which is it. fresh or pickled? No. It will not be the same at all… you will just have sweet cucumbers and it will be awful. Sorry. Can I use fresh cucumbers to make these instead of premed pickles? As long as you don’t use Kosher pickles. They will become rubbery. My fiance likes the spears not slices..think it would still work? I am so glad to hear that! Your feedback made my day! xoxo! I have made these using this recipe and it was a huge hit I have had so many people asking me to make them for them just would like to say thank you for sharing recipe! These look delicious! I love fire and ice pickles, but have yet to make them at home. I want to use your recipe as the muse for my first time! thanks so much for sharing! I’ll report back with how they turned out! I honestly don’t know enough bout canning to answer that question. They were cooked once in the first process of pickling, so my only concern would be that might get mushy after the second processing. However, it is such an easy recipe and relatively cheap. You could try a jar or two and see what happens. If they work out, please let me know. I am curious. They don’t last long in my house; but only because they are ate so fast. Yummy. I would so enjoy these pickles! I would particularly like the heat! I also like that you use already made dill pickles! You made my mouth water. Feel free to send me some! Love you! So now I’m singing that Fire & Ice song by Pat Benatar! lol! Spicy is my game so I’ll be making these pickles and then will promptly eat the whole jar all by myself. I”m going to hide them from J too 😉 heeheehee Actually, we are busting out the smoker this weekend and these pickles will be awesome with the bbq.